Free Lesson Plan Download at the End of this Post! A few years ago, I had the privilege of attending a conference at Phillips Exeter Academy in New Hampshire to study Shakespeare with teachers from all over the world. While the Shakespeare part of the conference was amazing, the bigger takeaway for me was Harkness. Harkness, as defied on the Phillips Exeter website, is "a collaborative approach to problem solving and learning." Students sit around a table and discuss issues and solve problems as a group. It is a democratic way of learning where all students are equal and share ideas equally. The teacher presents a topic, issue, or problem, students do research, and then convene around the Harkness table. At Phillips Exeter, they teach a majority of their subjects using this method. In the old classroom, teaching was teacher-centered and the teacher was perceived as holding all of the knowledge. Classes were lecture and note-taking centered, and students learned by listening to someone else tell them about their learning. Moden classrooms are student-centerd where students bear the burden of taking control of their learning. Teachers present topics or ideas and students have to problem solve in order to direct their learning. That is, in a student-centerd classroom, students should be doing most of the work. 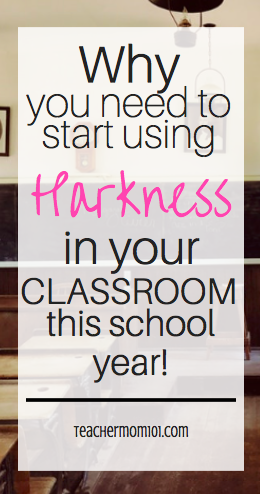 Harkness fits into the student-centerd classroom perfectly. A traditional Harkness would work by a teacher assigning reading and maybe some discussion questions to accompany the reading. Students complete the reading on their own, either as in-class assignments or homework, and then they discuss around the Harkness table. The teacher might provide a few "starter" questions, but students take control of the discussion. Students can ask questions to the group, to one another, they can answer questions, or raise related issues. All discussion should go back to the text. The teacher does not get involved. If the conversation lulls and students sit in silence, then the teacher must allow the silence until a student speaks. 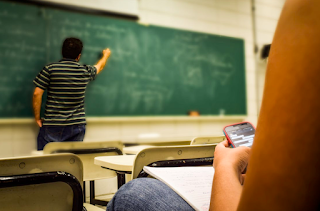 Though I loved participating in Harkness during my time at Phillips Exeter, and I saw such merit in the process, I was very hesitant to use this in my own classroom. I teach sheltered ESOL classes (classes where every student is an ESOL student), and I also teach special education classes where students have varying learning disabilities and often physical disabilities as well. I made the mistake of assuming that Harkness would not be valuable for them. I decided to try Harkness the last week before Spring Break. We had been working very hard for weeks on writing informative essays, and my students were burned out (and so was I). We needed to do something that would usher us into the break on a really positive note. I chose an issue that I thought would spark a lot of conversation, and I found resources. I decided to focus on the issue of Incarceration in the United States. The Essential Question was "Should older inmates be paroled and released from prison if they are seeing a life sentence?" I found articles on Common Lit and our reading intervention program Achieve 3000 about the effects of incarcerating people for life. I found poetry by Daniel Beaty about the effects of incarceration on families, and a Ted Talk from a judge about the role of the court in the justice system. We spent the week reading these articles, watching the videos, and discussing these questions in small groups. Each day we added another layer to the conversation. It took a week to go through all of the materials because my students need extra time to dissect big concepts and grapple with the language barrier. On Thursday, I explained how Harkness would work. I outlined my rules and expectations. I showed a video of another class doing Harkness so that they could see what it looks like. I explained that when they came to class the next day, the desks would be arranged in a circle, and Harkness would begin right away. On Friday, students came to class ready. I was still a little skeptical about how it would go, so I made a "talking ball" and a rule that only the student who had the ball could talk (my students have a tendency to talk with no self-control!). I was still skeptical because I fully expected chaos if students knew that I could not intervene or speak during the Harkness. I told students that we would Harkness for 30 minutes, and if the conversation was strong, I would allow it to continue for longer. 1. What effect does incarceration have on the individual? 2. What effect does incarceration have on the family? 3. What effect does incarceration have on society? 4. What can we do about it? The discussion began slowly. Students were unsure of what to say when the teacher was not there to ask the questions. I was nervous. Then, the leaders of the class rose to the top and started asking questions. Student hands shot into the air. They respected the ball. It was passed. Students spoke one at a time, respecting one another's opinions. Students referred to the texts. They referred to the poems. They referred to the Ted Talk. The Inclusion Teacher who I work with and I exchanged surprised glances across the room. The conversation evolved. Students discussed incarceration through the lens of poverty and racism. They discussed addiction to drugs and alcohol. They discussed violence against women and toxic masculinity (say what?! Woah!). They discussed shame when one student asked the group, "how would you feel if you were in prison and had to talk to your Mom on the phone about what you had done?" They discussed forgiveness and the public's responsibility to incarcerated persons. They discussed prison culture in entertainment and the effect that it has on young people's perception of prison (the conclusion was, entertainment makes prison look "cool"). They discussed the effect of incarceration on celebrities, what it does to their careers, and what message they send to their fans by going to prison. They shared their own personal experiences with incarceration - when a family member had gone to prison, or when they had been arrested and taken to the juvenile detention center. They were brutally honest about their experiences. And their classmate listened openly and respectfully. The 30-minute mark came... and went. My students discussed for an hour and 15 minutes. Our class periods are 90 minutes, so I had to stop them because the bell was going to ring. They were NOT happy. They wanted to keep going. My students discussed incarceration respectfully, thoughtfully, and thoroughly for over an hour and I said nothing. I contribute nothing. I asked zero questions. The students took complete control, and I was blown away. The Inclusion teacher I work with told me that at the end of that day in their math class, students were still discussing Harkness and asking her when we were going to do it again. This was am emotional experience for me. I severely underestimated my students and they showed me what intellectual, thoughtful, and bright kids they truly were. I was so proud. I am already planning our next one. Harkness can be done at any age in any stage of education. I encourage you to try it in your classroom. Your students will learn from one another, and you will learn from them. Spiderweb Discussion - One teacher's modification to Harkness works fabulously with her students! What is the "Harkness Method?" - a wonderful and thorough blog post about what Harkness is... and what it isn't. Sign Up and Receive your FREE Harkness Lesson Plan! This is amazing! I am totally going to try this. I often underestimate my students too since I teach in a pretty high-poverty/low level student population, but I think with the right topic and structure, they could really thrive in this. What a great story! And so inspiring!! I love the entire idea of Harkness. I teach 5th grade and know they are always dying for discussion. This is something I will absolutely integrate into this next school year during my writing class time. Thank you so much for sharing! This along with Cornel notes should make for an amazing school year! Awesome! I am so glad. Hope you have a wonderful year! I'm 4 weeks into the year, and thinking about moving toward Harkness and Cornell Notes. I'm nervous and feeling overwhelmed. Our district is trying to make a major shift to google classroom without a lot of training. I am all over the place! Hopefully this will be a calming effect that will give me an opportunity to think google while still providing my boy heavy class with the instruction needed to help them be successful on our state test. Wish me luck and inspiration!